Are you interested in cryptography, either as a user or as a developer? Read on -- this blogpost talks about some of the UI choices we made, as well as about the technical challenges of working with the existing crypto libraries. 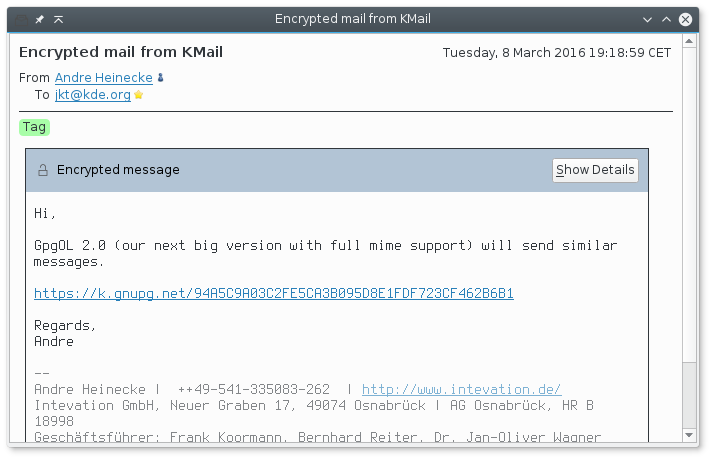 The next version of Trojitá, a fast e-mail client, will support working with encrypted and signed messages. Thanks to Stephan Platz for implementing this during the Google Summer of Code project. If you are impatient, just install the trojita-nightly package and check it out today. 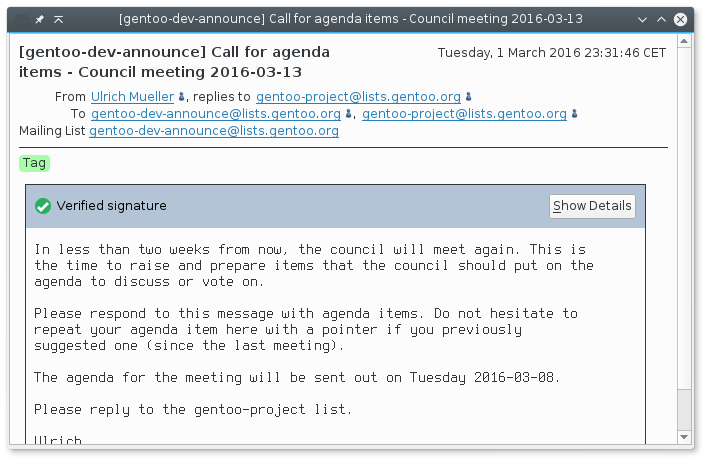 Some other e-mail clients show a yellow semi-warning icon when showing a message with an unknown or unrecognized key. In my opinion, that isn't a great design choice. 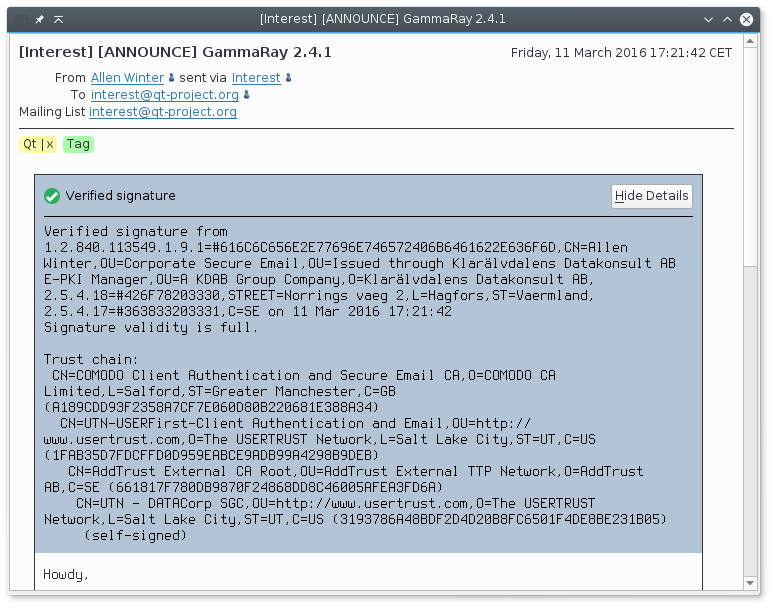 If I as an attacker wanted to get rid of the warning, I could just as well sign a faked but unsigned e-mail message. This message is signed by something, so we should probably not make this situation appear less secure than as if the e-mail was not signed at all. We are also making a bunch of sanity checks when it comes to signatures. For example, it is important to verify that the sender of an e-mail which you are reading has an e-mail which matches the identity of the key holder -- in other words, is the guy who sent the e-mail and the one who made the signature the same person? We had to start somewhere, so right now, Trojitá supports only read-only operations such as signature verification and decrypting of messages. It is not yet possible to sign and encrypt new messages; that's something which will be implemented in near future (and patches are welcome for sure). Originally, we were planning to use the QCA2 library because it provides a stand-alone Qt wrapper over a pluggable set of cryptography backends. 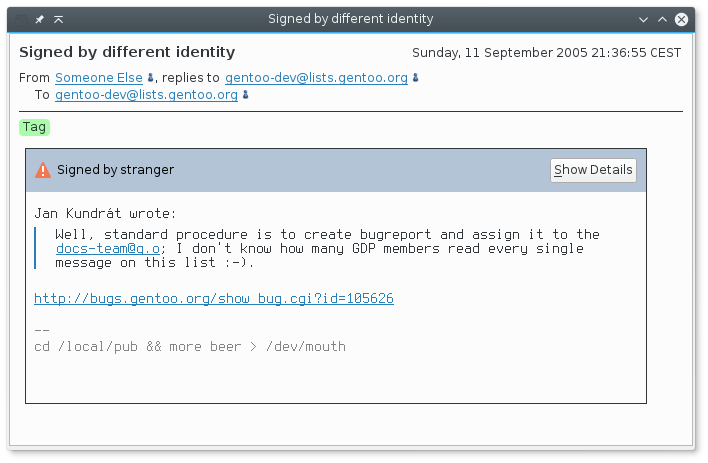 The API interface was very convenient for a Qt application such as Trojitá, with native support for Qt's signals/slots and asynchronous operation implemented in a background thread. However, it turned out that its support for GnuPG, a free-software implementation of the OpenPGP protocol, leaves much to be desired. It does not really support the concept of PGP's Web of Trust, and therefore it doesn't report back how trustworthy the sender is. This means that there woldn't be any green padlock with QCA. The library was also really slow during certain operations -- including retrieval of a single key from a keystore. It just isn't acceptable to wait 16 seconds when verifying a signature, so we had to go looking for something else. Compared to the QCA, the GpgME++ library lives on a lower level. Its Qt integration is limited to working with QByteArray classes as buffers for gpgme's operation. There is some support for integrating with Qt's event loop, but we were warned not to use it because it's apparently deprecated code which will be removed soon. Finally, let me provide credit where credit is due. Stephan Platz worked on this feature during his GSoC term, and he implemented the core infrastructure around which the whole feature is built. That was the crucial point and his initial design has survived into the current implementation despite the fact that the crypto backend has changed and a lot of code was refactored. Another big thank you goes to the GnuPG and GpgME developers who provide a nice library which works not just with OpenPGP, but also with the traditional X.509 (S/MIME) certificates. The same has to be said about the developers behind the GpgME++ library which is a C++ wrapper around GpgME with roots in the KDEPIM software stack, and also something which will one day probably move to GpgME proper. 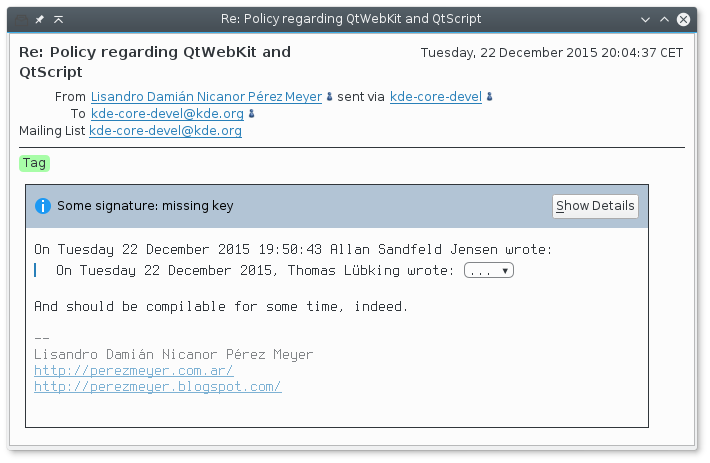 The KDE ties are still visible, and Andre Heinecke was kind enough to review our implementation for obvious screwups in how we use it. Thanks!